Feb 11, 2019 | What Am I Reading? 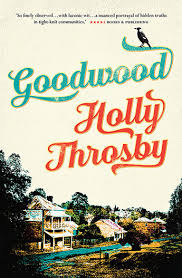 After reading Holly Throsby’s recent release Cedar Valley, I was keen to read her debut novel Goodwood (Allen & Unwin Books 2016). The two fictional towns, set in the rural south of Australia, are depicted with a keen eye for the claustrophobic life of small communities and well-tuned antennae for the complex social relationships upon which such places thrive. The opening chapter of Goodwood begins: ‘Goodwood was a peaceful town before the tragedies. It sat itself quietly between a mountain and a river.’ This is accompanied by a hand-drawn mud map (‘not to scale’) which shows the main shops, paddocks, houses and services of Goodwood, nestled – as the opening suggests – between the Gather River, Grant’s Lake and the mountain. The year is 1992 and our narrator is seventeen-year-old Jean, but in keeping with the premise that in small towns, everyone knows everything about everyone and nothing is a secret, we are given third-person perspectives from many other characters, sometimes in the form of news or information that Jean hears about later, but often just what she surmises or imagines to be the thoughts or actions of her fellow townspeople. Despite the peaceful beginning lines, the opening action is anything but. Not one but two terrible tragedies occur within a week, and the town is left reeling with incomprehension and a strange feeling of foreboding. The first thing that happens is that the coolest girl in town, eighteen-year-old Rosie White, vanishes from her bedroom overnight. Nobody has ever locked their windows in Goodwood, but Rosie’s disappearance changes everyone’s behaviour, while her family, her boyfriend, her friends and her workmates all come under suspicion. Then a week later, the most popular man in town, Bart McDonald, sets off on his regular Sunday fishing trip and never comes home. His family is devastated, and the community cannot seem to take in the reality of this double disappearance. But are they connected? Speculation and suspicion mount, with every local having an opinion about what has happened to Rosie, or to Bart, or to both of them. Meanwhile, Jean, who is keeping some secrets of her own, struggles to align her moral conscience with her outward demeanour, and wonders if what she knows, and what she discovers, will change the outcome of what has happened. This is a story absolutely full of rich, complex and eccentric characters, with an intriguing plot that keeps us guessing until the very end. With a dry and witty humour (frequently funny) and careful and moving observation of human nature (always poignant), Goodwood will endear you both to this little imagined town and to the characters that live in it.